The Cantina Produtori Valle Isarco cellars are devoted to the production of quality white wine. Founded in a traditionally vine-growing area, the Cantina Valle Isarco is the newest wine-making cooperative in South Tyrol; yet, its premium white wines have already become famous both at home and abroad. Because the Valle Isarco enjoys the ideal climate for growing white grapes, the Cantina Produttori Valle Isarco specialized in the production of white wine. The modern facility at Chiusa produces one million wine bottles every year, of which 80% are DOC (quality wines from specific vine-growing areas). The elegance and character of the wines reflect the philosophy of the Cantina and of its 130 members: Quality without Compromise! 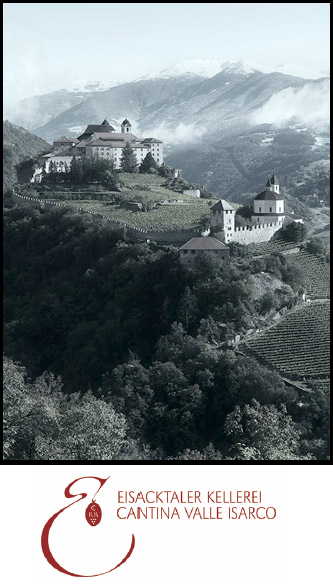 The Vineyards: With great enthusiasm and commitment, the 130 members of the Cellars grow grapes on 350 acres in the northernmost production areas on the southern side of the Alps; vine-growing is carried out on steep sunny slopes up to 900 meters above sea level. Here, the ideal conditions are found for producing fresh, aromatic wines with a pleasant fruity note. The soft, well-ventilated terrain and rather dry climate in the period when the grapes ripen, with numerous sunny days and broad temperature swings from day to night, create white wines of exceptionally high quality. Although mostly red wines were produced in the early 1960s, the Cantina Produttori Valle Isarco is now famous for its excellent whites. Philosophy: The success of the Cantina is due to the typical regional quality of its wines and to the high quality maintained during production, where traditional wine making skills are combined with modern, innovative techniques. Special care has been taken to employ natural methods that respect the grapes. Controlled, limited production, as well as the great support offered to wine producers through dependable consulting services and training courses, ensure that wines of the very highest quality are obtained. Winemaking: Painstaking care is given to the vineyards over the summer months, before the grape harvest begins in early September. First to be harvested are the early white varieties Müller Thurgau and Sauvignon, followed by the other white grapes. The last to be picked are the red grapes, in late September/early October. Ripening is effectively promoted by the late summer climate and its beautiful warm days and cool nights, that give grapes of excellent quality and with high sugar content. Essential prerequisites for producing a great wine are grapes of excellent quality, skilful processing of the marcs, careful pressing, and close supervision of the fermentation process by the cellarman. After the grapes are picked (by hand, of course), they’re immediately sent to the cellars, where each individual lot is checked for quality and evaluated for health and sugar content. The must is then fermented at a controlled temperature in steel tanks or wooden barrels. After refining and aging for a period of time that depends on the variety and quality of the grapes, the wine is bottled.